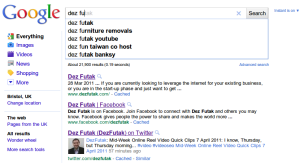 "I'd heard about Dez Futak doing 'something on the internet', so I thought I'd find out for myself. Well, when I Googled his name this morning just to check, I discovered 7 pages of links with his name, so I guess what he's doing must be working!" So how do you brand your business online? The best way is by leveraging what the technologies behind the internet to help amplify the effect of your own content creation. Most businesses now recognise that this is of paramount importance in the increasingly transparent world of the internet. How do you want your business or personal presence to be perceived by others? Increasingly, the first place people are going to find out about you is online. It's the natural thing to do. In order to maximize the chance that they'll find information about you that you want them to know, you must be putting out content regularly, through many different channels. I was shocked (I shouldn't have been really) to find a freelance job being advertised this morning, where the main task was to use "Astroturfing" techniques against another company in order to tarnish its reputation. Online reputation management, social media management and content creation are now longer a luxury for a select few large corporations. Every business must now seriously consider how it wants to be known. Gone are the days of simple Search Engine Optimization strategies - we now also have social media optimization, reputation optimization, and so on. So how do you go about leveraging these online technologies? There are, of course many other ways to amplify the effect of your dynamic content online, such as the use of Wordpress plugins which automatically publish your content to RSS feeds, Web2.0 properties such as Squidoo and so on. In fact, not a month now goes by without some new and clever traffic-getting tool popping up online, and from the ones I've seen so far, they all seem excellent. So, the battle is on: either you are branding your business, or someone else will for you, whether you like it (perhaps because you've outsourced your social media management to them), or not. Gone are the days of simple Search Engine Optimization strategies – we now also have social media optimization, reputation optimization, and so on.